2018 brings a new front grille, minor styling tweaks, and, for the S63, more power. Although they were only launched for 2015, the Mercedes-AMG S63 and S65 have each been given a mid-life facelift, just in time for the Frankfurt Motor Show. 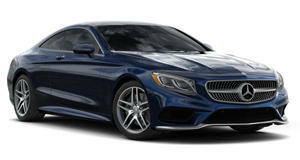 The overall updates are relatively minor, but perhaps the most noticeable change is that both big coupes have received the new AMG Panamericana grille (first used on the AMG GT lineup) as well as larger front air ducts for improved cooling. There’s also a few minor bumper styling tweaks, both front and rear, and additional chrome trim. The interiors for both are also slightly revised, with the biggest and most visible change in the form of a new updated graphics for the 12.3-inch digital screen. Specifically, the software has been updated to handle 3D topographical map displays and Car-to-X messaging. Also new is Active Distance Control Distronic and Active Steering Assistant. There are also three new trims available: High-Gloss Brown, Burl Walnut, Satin-finish Ash Grey. There’s also a new upholstery option called designo Exclusive Nappa leather Porcelain/Tizian Red. Under the hood is, more or less, the same, but there are some important updates that’ll matter to those in the market. The AMG S63 receives a more powerful version of the 4.0-liter twin-turbo V8, now producing 603 hp and 664 lb-ft of torque. The AMG S65, meanwhile, retains the same output from that mighty 6.0-liter V12 with 621 hp and 738 lb-ft of torque. The AMG S63, however, comes with a nine-speed AMG Speedshift transmission, sending power to all four wheels via the 4Matic system, while the AMG S65 retains the seven-speed gearbox and rear-wheel-drive only. Performance? The AMG S63 will do 0-60 mph in 3.4 seconds while the AMG S65 does the same sprint in 4 seconds flat. Expect to see both the 2018 Mercedes-AMG S63 and S65 arrives in dealerships in mid-2018, and pricing will be announced closer to that on sale date.